my views on random subjects. Etisalat launches DC HSPA+ : What does it mean to you ? Etisalat Sri Lanka are in the process of upgrading their current HSPA+ (Evolved High-Speed Packet Access) mobile broadband technology & speed with the launch of Dual Carrier HSPA+. I’m not going to speak about the technical stuff relating to such technologies here. (You can check on the links) But Etisalat had organized a small meet-up for Sri Lankan bloggers & tweeps who are interested on the subject. I got a chance to attend the event and got some insight on the new launch. The marketing and engineering team did a good job in explaining the technology and showed some live demo too. Before discussing more on that, I hope everyone’s aware that all five Mobile ISPs in Sri Lanka provide high speed internet access (3G or above) to their customers. If I’m not mistaken, the technology each operator uses differs (at-least by the name). As per the TRCSL, Dialog & Mobitel, who were first to offer high speed internet, use the HSPA technology. Hutch, the new entrant to the race also uses HSPA (as per their website). TRC says that Airtel uses HSDPA and Etisalat uses HSPA+. Etisala’s network backbone has been around for a long time in Sri Lanka (earlier as Celltel and then as Tigo). But after the company was bought by well known Etisalat group and re-branded as Etisalat Sri Lanka, it has seen a rapid growth and expansion including the launch of high speed internet. Even though I don’t use Etisalat mobile broadband, I’ve observed users in twitter claiming Etisalat’s mobile broadband speed is better compared to other operators. So what happens when Etisalat upgrades their current technology to DC HSPA+ ? Obviously the maximum possible speed offered by the network will increase. This will give Etisalat, an edge over other networks, to accommodate more subscribers and provide better speed to all of them since they will have more bandwidth to offer and given the fact, mobile broadband is a “shared bandwidth service”. The Etisalat engineers at the meet-up said they can promise speeds twice as fast as their current offering. Considering the fact that we are living in an “Information-driven era” where our need is to access more and more ‘high quality’ content over a short period of time, we end up requiring speedier internet connection. The game is about speed. The operator who provides better speed wins. Where does LTE (4G) stand ? Most of must be aware about LTE (or 4G), the next generation of high speed internet which was launched on a test phase (non commercial) by Dialog and Mobitel, last year. A question was also raised at the meet-up as to whether Etisalat is considering launching LTE. The engineers said they have log term plans on LTE but pointed out it will take time since LTE is a technology which is still under development and therefore will be a costly technology to adopt and market. They are quite right about that, since LTE(4G) is different from HSPA-which is a high speed version of 3G. Also implementing DC HSPA+ will be easier as it is done on top of their existing 3G or 3.5G or 3.75G network (means swift island-wide implementation) whereas implementing LTE will involve installing new infrastructure (means it will take more time to implement island-wide). Then comes the question of affordability over availability. To access DC HSPA+ technology, we’d need “DC HSPA+ supporting” devices (same applies to LTE) including mobile broadband modems, mobile phones, mi-fi routers etc. Now you’ll ask why should we hype about DC HSPA+ when we can’t make the full use of it without a supporing device ? Well, the broadband modem advertised in the Etisalat website is priced at Rs.16000, which is not affordable to everyone. But I don’t think it will take much time for the prices to drop or for us to see compatible but cheaper modems in the market. Also as per this article from February 2012 at-least 93 user devices (including 4 mobile phones) support DC HSPA+. The article is 6 months old and I’m sure the numbers would have at-least doubled by now. Another good news is that the latest edition of iPad (released some time ago) and some variants of Samsung Galaxy S3 and some variants of HTC One X and Nokia Lumia 900 also support DC HSPA+ ! I hope the newer devices will probably support the technology. But what matters most are the Mobile Broadband modems (dongles) supporting DC HSPA+. It all depends on their price and availability. Also there is a misconception that Etisalat is able to provide better speeds since they have less customer base. (i.e bandwidth is shared among less number of users) ! It may have been true sometime ago. But I should note that Etisalat too has a big customer base now. Also as I pointed out earlier Etisalat currently uses HSPA+ whereas others use HSPA. I have seen lot of users shifting to Etisalat from other networks and claiming they’re getting better speed. Also the Etisalat representatives pointed out that their biggest marketing point is the broadband speed. So they closely monitor their speed and bandwidth on a daily basis to make sure they maintain the standard. That’s a good move. Also I wish operators like Dialog and Mobitel also improve their current HSPA network to provide more speed/ bandwidth before implementing LTE because they are facing a big competition in the mobile broadband area. Also LTE implementation (island-wide) will take time and it won’t be cheap either (at-least for now). Dialog eZ Cash : Turn your mobile phone into a wallet ! I have faced some annoying moments when I go to pay my bills at supermarkets and then I realize that I’ve left my wallet back in my room. I then call my room-mates to check weather it’s there or if they can bring it ! But I don’t think it’s gonna happen again, thanks to “eZ Cash“, a new revolutionary service from Dialog Axiata, the leading mobile service provider in Sri Lanka with over 7.5 million customers. Dialog already has “eZ Pay” (an mCommerce service currently available for NDB bank & Seylan Bank Credit/ Debit card holders) and “eZ Card Pal” (a way to link your credit card to your mobile number and carry out Dialog bill payments). But “eZ Cash” totally differs from them and does not require you to have a Credit card or even a bank account ! In other words it literally replaces your physical wallet and transforms your mobile phone to a digital wallet with an additional security of a lock(password) ! it’s function is similar to a ‘debit card’ except for the fact you don’t need to carry a card and swipe anywhere ! And the service is approved by the Central Bank of Sri Lanka. It is a USSD based service and all you have to do is dial #111# from your Dialog Prepaid/ Postpaid connection and follow the steps (including, creating your PIN code) to register, free of charge. (If you are lucky enough you may end up winning up-to Rs.10 000 as an initial top-up from Dialog ! 😀 ) Once registered, you are required to top-up the “wallet” (deposit) at any Dialog eZ Cash points around the country. Upon registration a classic account with a account/ transaction limit of Rs.10 000 is provided and one cane visit any Dialog Service Point to get it upgraded up-to Rs.25 000 limit. You can even withdraw the money at any eZ Cash points. That’s it ! Dial #111# anytime and you are ready to perform a transaction. 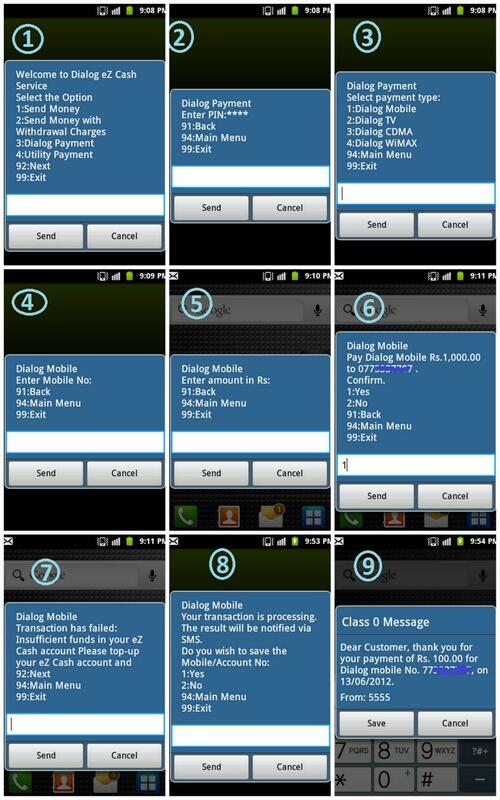 1- sending or receiving cash direct from your mobile to any Dialog customer. Since most of the transactions can be done from wherever you are, it is convenient and hassle free. You can also request for a mini statement via USSD. ( Refer here for more instructions) And you are required to enter the PIN code (like in ATM machines) before any transaction, so it is more secure too. Also note that (obviously) there is a service fee for certain transactions. Refer the “pricing” tab here for the detailed information. I did a simple bill payment (refer above picture) with the free top-up Dialog offered and it worked just fine ! You get an error message when you don’t have enough funds. (refer number 7 above). I hope the interactions at the eZ cash points will be smooth too and that the merchants will be educated well on the subject, too. Dialog has a dedicated short hotline (7111) for the service (no need to dial the general line and wait !). I feel that this service has a huge potential. In my case it is more convenient since I don’t use a credit card. So I don’t need to wait in ques at Cargills with my debit card to pay the bills. And I hope other service providers too will join the race and we can expect more promotions from Dialog & the merchants. Dialog did a commendable job with the introduction of this innovative service (that can be accessed by anyone across the country even without a bank account) and two thumbs up for them !